Google on Saturday dedicated a Doodle to India's "first" female doctor Anandi Gopal Joshi to mark what would have been her 153rd birthday. The Doodle is created by Bangalore-based artist Kashmira Sarode who imagines Joshi celebrating her degree. 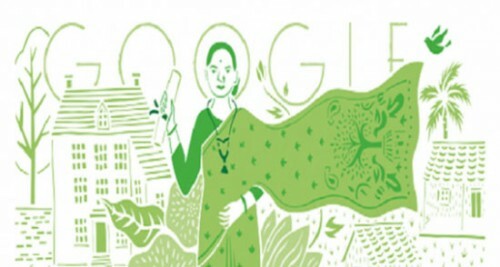 "Not only was she India's first female doctor, but she was only 19 years old at the time," Google said. Born in 1865 in what is now Maharashtra, she was married at the age of nine and became a mother at 14. But the household responsibilities could not clip the wings of this young woman's dream. Her husband also encouraged her to continue her education and her interest in medicine. At sixteen, battling ill-health but determined to succeed, Joshi set sail for the US. She earned her medical degree from the Women's Medical College of Pennsylvania (now known as Drexel University College of Medicine) and returned to India with dreams of opening a medical college for women. Joshi's young life was tragically cut short when she died of tuberculosis before she turned 22. However, her legacy and the path she paved for generations of women continues today. Interestingly, even a crater on Venus is named after her.